Microbial Root Conditioner is used to stimulate a plants built-in immune system thereby improving overall plant health and increasing resistance to attacks from pests and diseases. With conventional horticultural practices i.e. soil - most bacteria are beneficial to plants in terms of breaking down organic matter enabling the mineral elements contained within to be readily absorbed by the plant. In a hydroponic situation these beneficials are not present therefore the potential for problematic airborne or soil borne micro-organisms attacking hydroponic crops can be high. Mircobial is a wide-ranging aqueous solution derived in part from naturally-occuring plant extracts. Microbial is non-toxic to humans and animals as well as plants and is totally biodegradable and environmentally friendly. 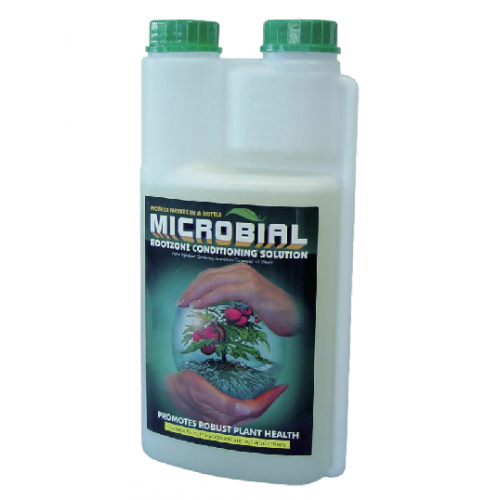 Microbial acts as a micro-cleanser and plant conditioner which cleans and rejuventaes plants. This allows the plant to naturally withstand attacks from common pests and biological contaminants like bacteria and fungi as well as algae and viruses.